GO WEST, YOUNG ARTIST. 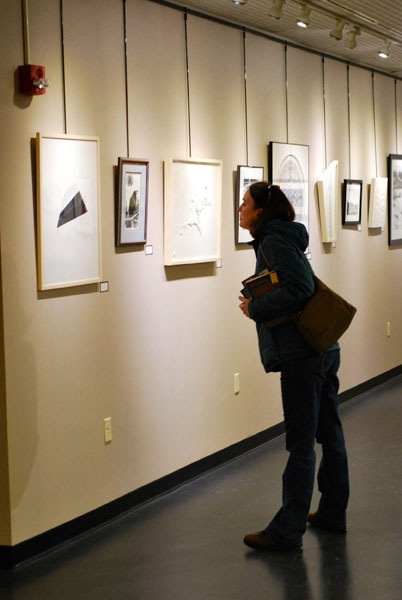 A patron eyes the artwork at last year’s ArtsWest exhibit. This year’s installment, ArtsWest 36, opens to the public Feb. 22. OK all you artists, it’s time to wash the dried paint and clay from your hands and show us what you’ve got. The annual ArtsWest exhibit is back for its 36th installment. For those that don’t know, Wisconsin ArtsWest is a juried exhibit sponsored and hosted by the L.E. Phillips Memorial Public Library in Eau Claire, and it’s open to all working artists and students, ages 18 and older, residing in Wisconsin. It’s a way for the scores of artists in the region to exhibit their talents and creativity, as well as providing a community-focused experience and support for the arts in a unique and personal way. It’s also a competition, because if there’s one thing artists like as much as creating, it’s the energy and spirit of a healthy contest. Each year, the competition is juried by a working artist, craftsperson, or qualified staff member from an art museum, gallery or art department of a university or college. This year’s juror is Anastasia Shartin, the visual arts director at The Phipps Center for the Arts in Hudson. Prior to that, she was a member of both the curatorial and education departments at the Walker Art Center in Minneapolis. Cash is awarded in four prize categories: the third prize winner receives $100, second prize receives $150, first prize receives $200, and the “Best in Show” winner will score big with $300. This year’s works have already been selected – the entry deadline was Jan. 6 – but that just means aspiring artists have more than 10 months to get ready for ArtsWest 37.